Despite a strong performance by Mr Kipling, the manufacturer failed to report an exceedingly good year. Premier Foods understandably doesn't want to give too much attention to recent controversy over how it treats suppliers. By way of reminder, last month a BBC panorama investigation revealed the company, which makes Mr Kipling cakes, Bisto gravy and Ambrosia custard, had been demanding 'pay to stay' payments. The business itself is showing signs of recovery after a difficult year of supermarket battles and food deflation. Sales of its 'power brands' in the fourth quarter of 2014 were down 3.6% to £158.6m, an improvement on the 5.1% recorded in the previous quarter. 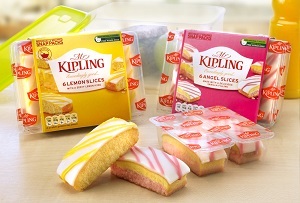 Chief executive Gavin Darby said newly relaunched Mr Kipling had delivered a 'particularly strong performance,' with sales in December up 28% on 2013. The overall figures don't look all that amazing but were enough to allay some of the concerns of investors, who sent shares soaring as high as 41.38p. At last check they were up 8.84% to 40p. He also reportedly said that supermarkets' efforts to slim down their own ranges would create more self space for Premier to take up. But as many of the grocers shift away from big shops to focus on convenience stores and more shopping goes online, this benefit might not turn out to be quite so valuable.